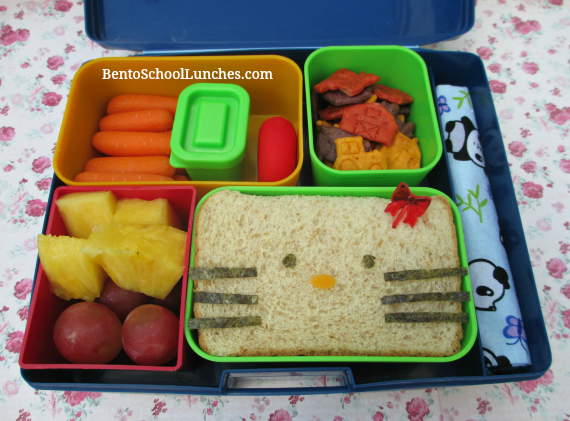 I made a simple Hello Kitty themed lunch the other day. This version is so easy to make, all I needed to do was cut the bread into halves and top with nori eyes, stripes of nori whiskers, cheddar nose and a bow pick. This lunch is packed in his Laptop Lunches. I created another version previously using my CuteZCute cutter which can be seen HERE. Bottom right: Hello Kitty sandwich. Bottom left: Seedless red grapes and pineapple chunks. Top left: Organic baby carrots, ranch in small container for dip and a babybel cheese. Top right: Annie's organic farm cheddar crackers. Far right: A cloth napkin. I love this! Who says Hello Kitty must be kitty-face shaped! Very kawaii, Rina! Have a good weekend!